A charity is working to find 'forever homes' for the newborns in time for Christmas. 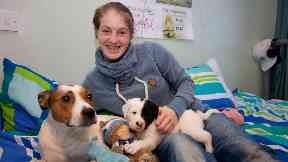 A homeless woman's pet dog has given birth to a litter of ten puppies after moving into a hostel. Within weeks of living in the hostel, Harper was unexpectedly found to be pregnant and soon gave birth to ten puppies. The 27-year-old from Edinburgh said: "I knew there was something up as Harper wasn't eating much so I took her to the vet. "I was shocked when the vet said she was pregnant. "Harper is my best friend - she helps me through the tough times." She added: "I was told by the council I'd have to give her up to get somewhere to live and I said I'd rather live in a cardboard box than be parted from her. "They then put me in touch with Dunedin Harbour as they take in animals too. "One of my fears was what would happen with my living situation with Harper having puppies. But it never even came up. "They just moved me to a bigger room so there would be more space for the puppies. "The help we've had is just incredible. "It's been a remarkable experience and not one I'll forget in a hurry." Dunedin Harbour, part of Dunedin Canmore, is among a few hostels in Edinburgh which lets people move in with their pets. The puppies have had support from All4Paws, a pop-up clinic run by student vets offering care to the pets of people who are homeless or vulnerably housed. Work is under way by the organisation to find "forever homes" for the newborns in time for Christmas. The company's homeless services manager Kevin Brodie said: "We are proud to support our residents and their pets. "Looking after a pet is great for people's physical and mental health. "It gives people a routine and something to care for."